It is important to note that Secure Boot is permanently activated on Windows RT devices such as Microsoft Surface RT, Surface 2, Nokia Lumia 2520 and other RT-based tablets. Since these ARM tablets are locked with Secure Boot, and there is no way to disable that option, there is no known method to boot them into anything other than Windows RT or its recovery image. While one can technically use a Windows RT recovery image such as one provided by Microsoft (http://www.microsoft.com/surface/en-us/support/warranty-service-and-recovery/downloadablerecoveryimage), there are no forensic tools available for that OS. However, one can still use a built-in DSIM tool to capture the content of a Windows RT computer but that is out of the focus of this article. BitLocker is an essential part of Windows security model. On many tablets, BitLocker encryption protects the C: partition. By default, BitLocker is activated on all Windows RT and many Windows 8 and 8.1 tablets. With BitLocker, one cannot access encrypted partitions without either logging in to Windows (by supplying the correct login and password) or providing the correct Recovery Key. This especially concerns situations with booting from an external device. If the user’s BitLocker Recovery Key is unknown, it can be retrieved from https://onedrive.live.com/recoverykey (providing that the user’s Microsoft Account credentials are known). Drives protected with BitLocker will be unlocked automatically every time the user logs in. As a result, if you have the user’s local login credentials for the given device, BitLocker does not represent a major problem. Important note, however : If the Windows tablet you are about to acquire is running, or if it is in the Connected Standby mode, DO NOT TURN IT OFF before trying anything to capture the system’s live memory dump. If the C: partition is protected with BitLocker, capturing a live memory image is your chance to obtain (and retrieve) the binary key used by BitLocker to decrypt information. If you are able to extract that key, you will be able to use a tool such as Passware Kit Forensic to mount BitLocker-protected partitions even if you know neither the user’s login and password, nor Microsoft Account credentials. Note that BitLocker is frequently disabled by default on cheaper, mass-produced tablets with smaller screens such as those running Windows 8.1 with Bing. Most Windows tablets are equipped with built-in non-removable eMMC storage. Physically, an eMMC module (Embedded Multi Media Card) is a BGA chip that is soldered onto the main board. As such, standard acquisition methods involving the use of a write-blocking SATA imaging device are not applicable. In order to acquire partitions from eMMC storage, you will need to boot from an external drive containing a bootable recovery image (such as Windows PE) and a set of forensic imaging tools. However, even that may present a problem with Windows tablets. Some Windows tablets are equipped with 32-bit UEFI ROM, while few other devices come with fully featured 64-bit UEFI. As a result, you may be unable to boot a 64-bit Windows PE image (or 64-bit Linux) even if the tablet is equipped with a 64-bit capable CPU. The majority of Windows tablets come with the Secure Boot option activated in their UEFI BIOS. Contrary to popular belief, you will NOT need to disable Secure Boot in order to start the system from an external device, PROVIDED that the OS you are about to boot is signed. In other words, you will be able to boot into a Windows 8.1 Recovery and Repair Environment (WinRE) or use a custom Windows PE 5.1 image. However, with Secure Boot activated, you may be unable to boot into a Linux-based forensic image. In order to disable Secure Boot, you will need to access the system’s UEFI by pressing and holding the Power-DOWN key while starting the device. However, access to Secure Boot is not required if you simply want to boot from a USB device containing a Windows PE or WinRE image. At the login prompt, tap the Ease of access icon. Tap the Shift key, the shift key should remain lit. In the lower right corner, tap the power key and select Restart. When the unit reboots, select the Troubleshoot option. From here select Advanced options. Select UEFI Firmware Settings. You will be transferred into UEFI BIOS. From there, change the boot order to allow starting from a USB device. If you are using a non-Windows PE (or WinRE) based image, disable the Secure Boot option. There is no need to touch this option if you are using a Windows PE 5.1 image. Connect a bootable USB device via a USB OTG adapter. Save settings and reboot. The system will start from the bootable image on your USB drive. Follow the acquisition routine of your forensic toolkit. Capturing a RAM dump of a Windows tablet is essential for digital investigations, and is one of the recommended practices by ACPO Guidelines. Most principles of capturing a live memory dump remain the same as compared to full-size PCs. 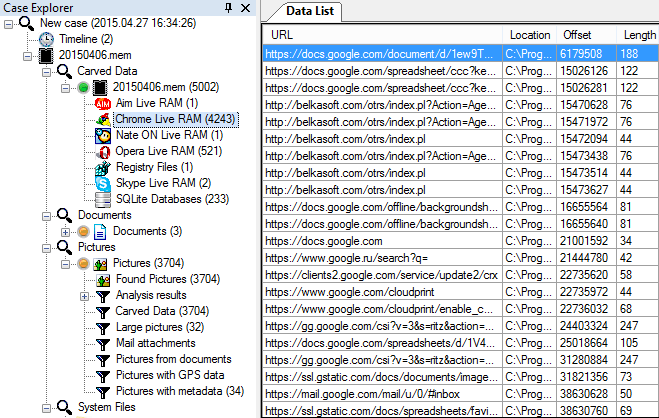 The goals, tools and the process of capturing volatile memory images are described in Belkasoft whitepaper “Catching the ghost: how to discover ephemeral evidence with Live RAM analysis”. However, there are minor differences between capturing volatile memory images on a PC and doing the same on a small tablet. One thing to consider is the lack of expansion ports such as FireWire on most tablets, which makes the FireWire attack impossible. Moreover, there is usually no possibility to add a FireWire port via an add-on card. 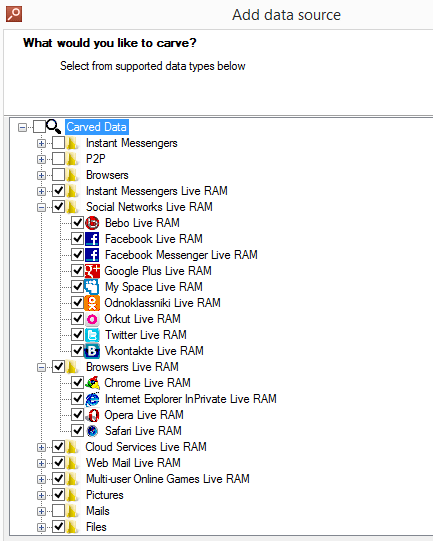 As such, on Windows tablets (with a notable exception of Windows RT devices) we are limited to using software tools such as Belkasoft Live RAM Capturer. Since most Windows tablets lack full-size USB ports, you will need to use a USB OTG (USB On-The-Go) adapter in order to connect a flash drive. Since tablets are usually equipped with one or two gigabytes of RAM, even a small USB stick or memory card will suffice. To conclude, acquiring Windows tablets is similar to dealing with full-size PCs, yet the process has its share of obstacles. We learned how to image partitions saved on soldered eMMC chips and how to deal with BitLocker protection. We figured out the meaning of Secure Boot, when and how to deactivate it if required. Finally, we reviewed steps to access the tablet’s UEFI BIOS and change device boot order in order to allow booting from a USB flash drive containing a set of forensic tools for imaging the device. Oleg Afonin is Belkasoft sales and marketing director. He is an author, expert, and consultant in computer forensics. Belkasoft Research is based in St. Petersburg State University, performing non-commercial researches and scientific activities. A list of articles by Belkasoft Research can be found at http://belkasoft.com/articles.